The limit lim [f(x)/g(x)] is, in general, equal, to the limit of the numerator x a divided by the limit of the denominator. But when lim f(x) and lim g(x) are both zero, the quotient takes the form 0/0 which is meaningless. But lim [f(x)/g(x)] may not be meaningless, which mean that it may exist. In this article, we shall consider how to obtain the limiting values in such and similar other cases. 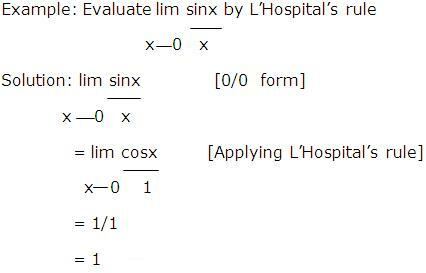 Note that in L’Hospital’s rule the numerator and denominator are differentiated separately, which is not the same as differentiating f(x)/g(x). Step I: Check that the limit of f(x)/g(x) is an indeterminate form. If it is not, then L’Hospital’s rule cannot be used. Step II: Differentiate f and g separately. Step III: Find the limit of f’(x)/g’(x). If this limit is finite, +∞, or -∞, then it is equal to the limit of f(x)/g(x). There are some more other indeterminate forms other that 0/0 and ∞/∞ forms. We can discuss about them now. In general, the limit of an expression that has one of the forms f(x)/g(x), f(x).g(x), f(x)g(x), f(x)-g(x), f(x)+g(x) is called indeterminate form if the limits of f(x) and g(x) individually exert conflicting influences on the limit of the entire expression. It is an indeterminate form of type 0.∞ because the limit of the first factor is 0 and the limit of the second factor is -∞ and these influences work together to produce a limit of -∞ for the product. Indeterminate forms of 0.∞ can sometimes be evaluated by rewriting the product as a ratio and then applying L’Hospital’s rule for indeterminate forms of type 0/0 or ∞/∞. Expressions of the form ∞-∞, 00, ∞0 and 1∞ are all indeterminate forms.